Voortrekker Road is the main dual carriage way that runs through the industrial town of Alberton that manufactures for the gold mining industry of the Witwatersrand. It used to be the main road to Durban before the National Roads Department built the N3 that now bypasses the eastern border of one it if many suburbs. I remember cycling on the unfinished highway in my teens, the seventies. Highways changed the nature of life. We took our first step towards speeding up life to a frenetic pace on that tarmac. You enter Alberton from Johannesburg by driving down the gold bearing ridge and crossing a small river, the Natalspruit. This flows into the Vaal River eventually, but is named in honour of the road towards Natal and Durban. I suppose today we should call it the KwaZulu Natalspruit. The river used to run yellow with mining acid and dust until some measure of control was forced on the processing for gold. In fact, it is more likely that the process became more cost effective and efficient, and a cleaner river the by product. I remember doing a school environmental project on the river: it was sterile. Occasionally it would burst its banks in heavy summer rains and flood the lower valley. Downstream in the townships it did more damage to the small houses packed close together in regular geometric patterns on sand roads with no drainage. Once the steep road flattens into Alberton there is a tall block of flats on the left, York Building. Before, after this for a long way on the left was the open valley of the Natalspruit. First they built new municipal offices that looked like a mini parliament (well before 1994) and then a garish shopping mall. When the valley was still green and unbuilt my grandfather built his first commercial building with apartments above the ground floor. 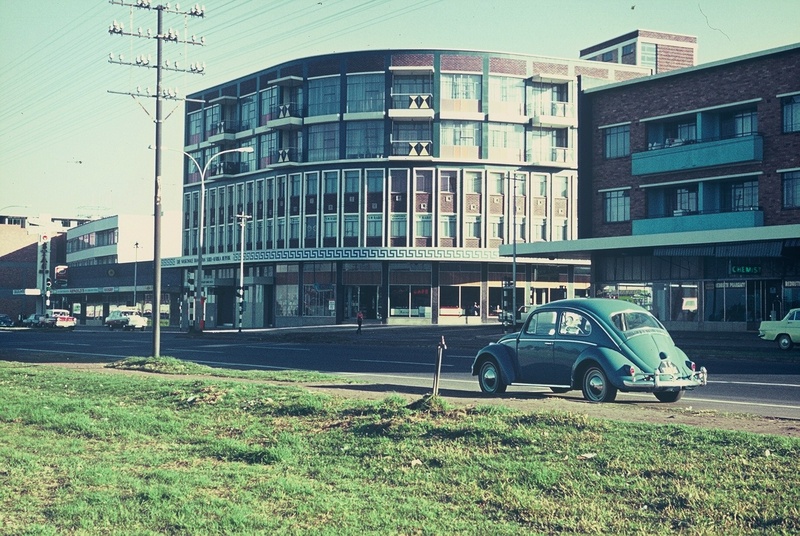 This was Stats Building, on the northern corner of Fore Street, which led to the pretty golf course nestled in the koppies, and Voortrekker Road, en route to Durban. I live in Durban now. My father and his brother built J.S. Centre on the southern corner of the same intersection. The façade was originally face brick and the building was rounded on the main corner with a pleasing effect. The bottom floor was commercial and the next two floors were offices, while the top two remained lovely north facing apartments. My Uncle Mika had the largest corner cafe there, in the years before supermarkets. Then Barclays bank took over and expanded to include the first floor as First National. My father’s auditors also remained as tenants on the first floor and in his corporate heyday his company occupied half of the second floor, including a wide passage that paralleled the curve on the corner of Voortrekker and Fore Street. My father’s office was the last on the left of the passage that ended in a strong room. J.S. Centre on the left, Stats Building on the right, in the Sixties. On the corner opposite the bank was another famous Alberton landmark; Slabbert’s Bottle store (off-license to Brits). Many were the times we would get our Old Brown or Richelieu, or Castles there. How strange it was, on returning to South Africa in the late 80’s, to still see separate entrances, despite the lifting of petty apartheid. Not many commercial businesses I remember were owned by South Africans. Greek and Jewish people, with a few Portuguese later ran most of the well-known ones. The family Levy had a roadhouse and the famous Casbah is still associated with Johnny Kongos. Opposite the Afrikaans High school was a café (newsagent/drugstore) run by the Kapp(osossouglou?) family, their son taught me French at GHS. My favorite sign was always “Fich and Ships” over the Funchal take-away, they had lovely daughters. Ha, great memories. Slabbert’s was in Stats Building, one of my grandfather’s building. Still going strong. You write well , too.